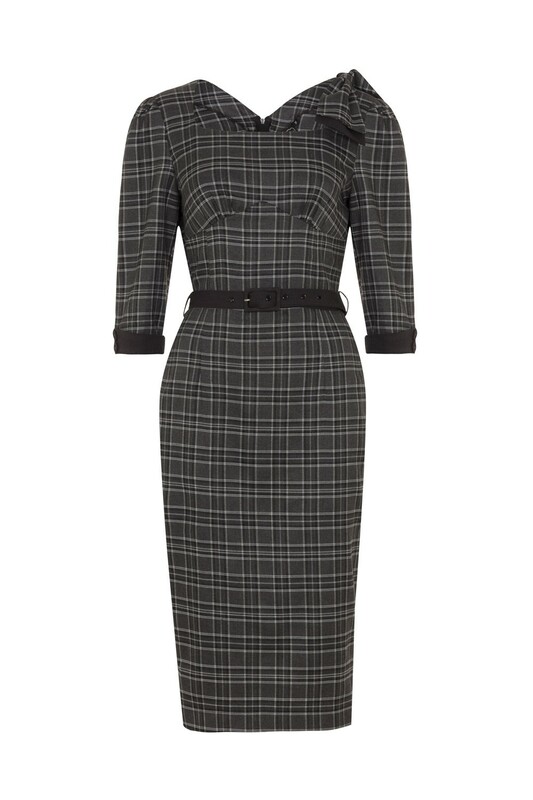 We present for the classy Vixen Veronica Tartan Grey Pencil Dress in UK Sizes 8-16. Crafted from a sumptuous thick yet supple dark grey fabric with limited stretch and is covered in a tantalising tartan print and it has a very distinctive 1940s pencil style fit to it which'll get you on the best dress list for the evening! This fitted staple features a classic square collar neckline with pleating to the bust and not too forget the elegant 3/4 puffed sleeves with dark grey turn ups and faux fabric buttons. The bow detail to the left shoulder will really transform this to a super elegant dress and to the back of the dress it features a fabulous 40s fishtail kickpleat with a dark grey lining finished off with a row of faux fabric buttons. The classy dark grey fabric belt will create a gorgeous and defined 40's silhouette!